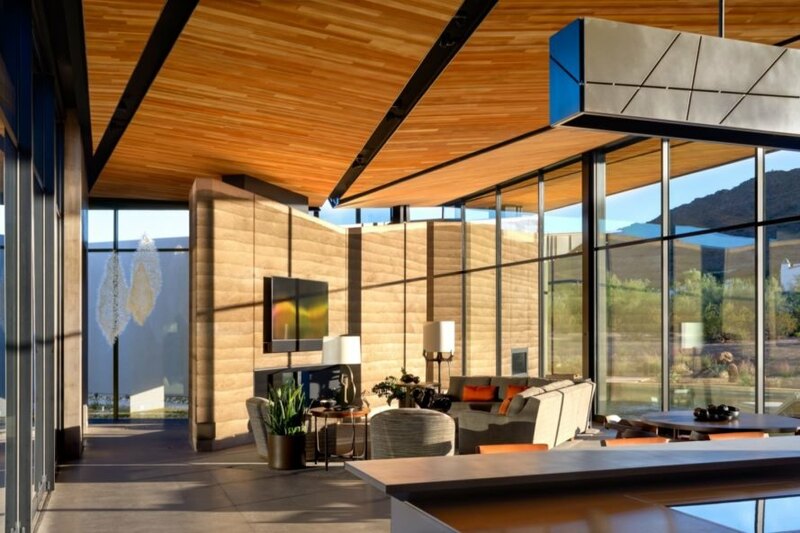 Named after the way light bounces off of its angled walls and ceilings, Dancing Light is an award-winning dwelling nestled in the desert town of Paradise Valley, Arizona. 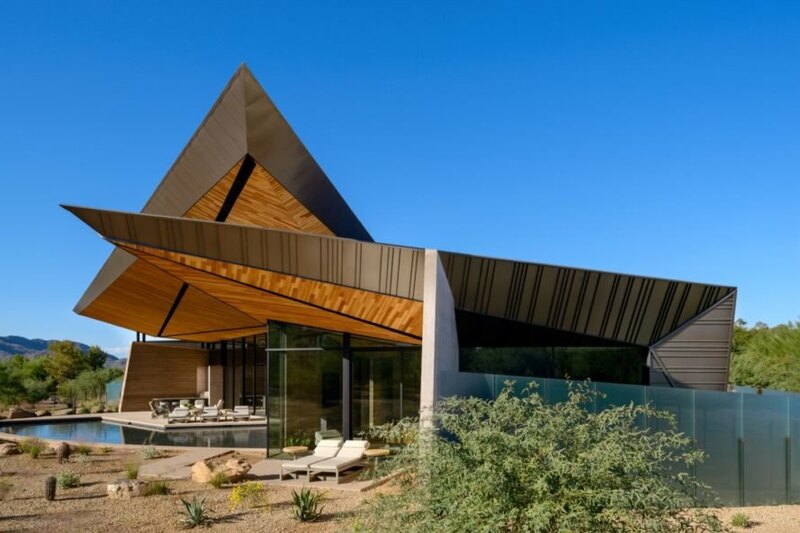 Local architecture practice Kendle Design Collaborative crafted the custom residence, giving it a sense of drama with pointy pavilion-like rooflines, yet grounded the design through indigenous materials and a desert-inspired color palette. Full-height walls of glass also embrace the landscape and the home is also set up to optimize indoor-outdoor living. Spread out across 6,200 square feet on a single story, the Dancing Light Home organizes the master suite, open-plan living spaces, and a four-car garage as seemingly separate structures around a central atrium—landscaped with rocks, succulents, and an ironwood tree—and linked with glass-walled corridors to allow daylight and cross-breezes to penetrate deep into the house. 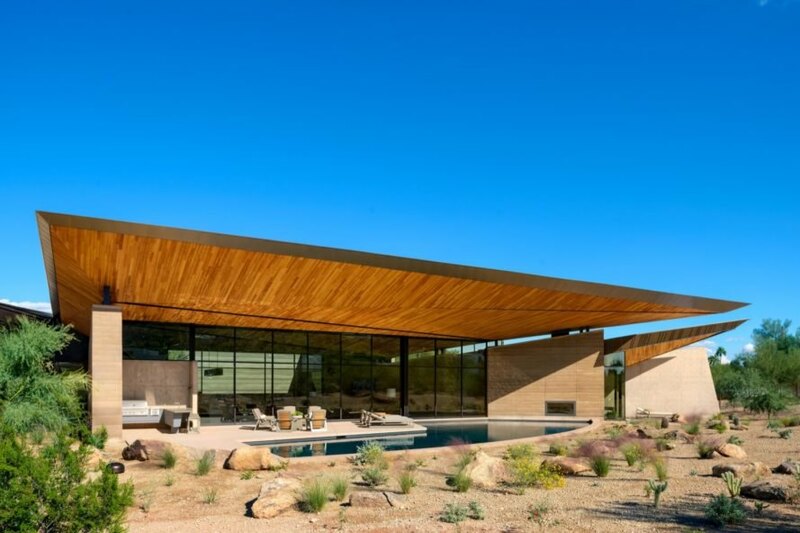 Key to the design is the dramatic floating roof canopy that lifts upwards at the outer edges of the home to draw the eye up and out towards panoramic mountain views. The angled, tectonic-like surfaces were inspired by the local geology and monsoon cloud formations; the “fissures” conceal the lighting and mechanical systems. 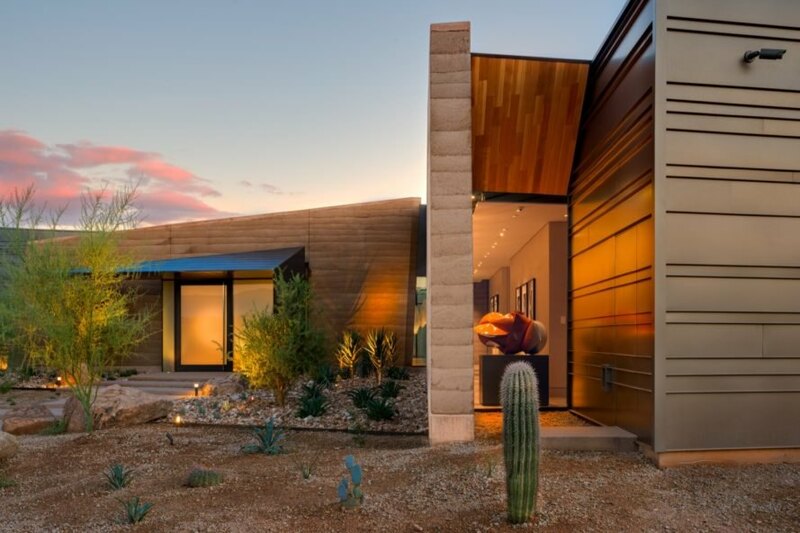 The cast-in-situ concrete walls and the rammed earth walls tie the building into the desert landscape and create a rustic feel. The materials also have the added benefit of absorbing heat during the day and dissipating it at night to reduce reliance on mechanical heating and cooling systems. 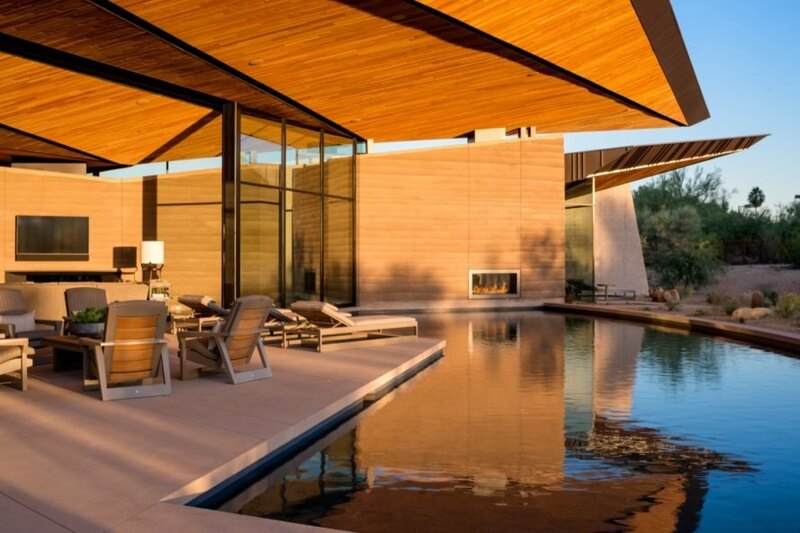 Dancing Light is a modern home in the desert of Arizona. The home lies in Paradise Valley, Arizona. It is named after the way light bounces off the angled walls and ceilings. The home is dramatic at every corner. Dancing Light embraces its desert landscape. Glass walls connect the indoors and out. The house spans 6,200 square feet. 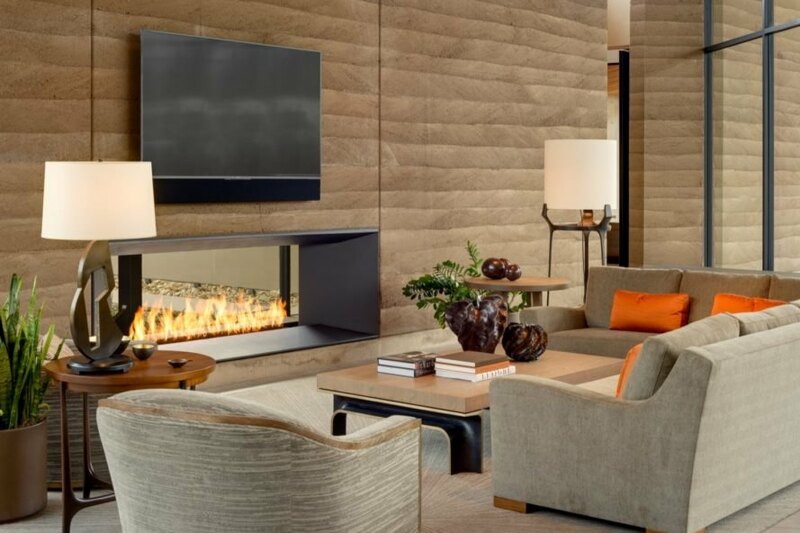 A contemporary fireplace is ideal for chilly evenings. An open floor plan makes entertaining a breeze. Neutral bedrooms help the residents relax and unwind. Even the bathroom does not shy away from connecting with the environment. A patio and swimming pool make the most of hot summer days. The striking, angular roofline is eye-catching.